Bowmore is best known for its whisky and Bowmore Distillery lies on the shore of Loch Indaal and is in the heart of the town. Founded in 1779, Bowmore Distillery is the oldest on the island and its malt is one of the most renowned, and one of the most commercially successful. The distillery welcomes visitors to its visitor centre and tours are available. Also unique to this town is the round church, reputedly designed to ensure that evil spirits had no corner in which to hide. A variety of shops are available, most of which are found on the main street which runs from the round church to the harbour. Other amenities include a supermarket, post office, bank and restaurants. VisitScotland / Paul Tomkins, all rights reserved. Bowmore is a fishing port on the east side of loch Indaal, towards the jetty and the distillery, Islay. VisitScotland / Paul Tomkins, all rights reserved. Bowmore is a fishing port on the east side of loch Indaal, towards the jetty and the distillery, Islay. VisitScotland / Paul Tomkins, all rights reserved. 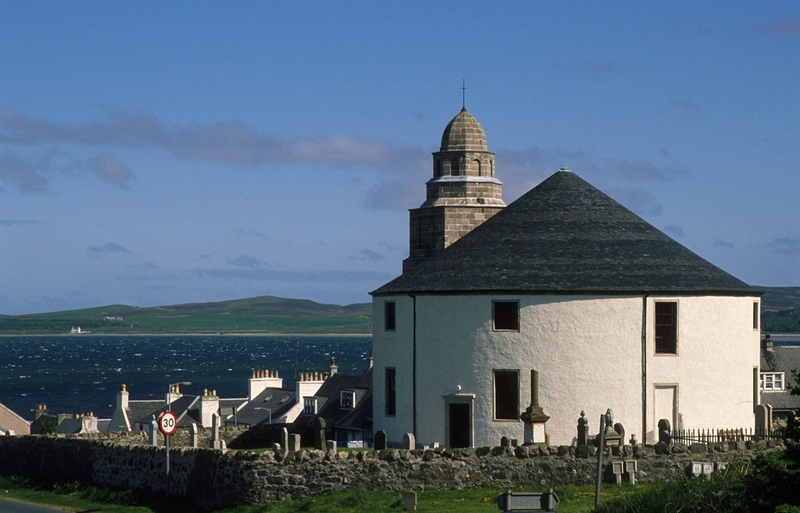 The circular church at Bowmore, a fishing port on the east side of loch Indaal, Islay. VisitScotland / Paul Tomkins, all rights reserved. Looking up to the church from Bowmore harbour, a fishing port on the east side of loch Indaal, Islay.